LATEST NEWS FROM GAZA ..
29th July 2014 - El Wafa Hospital for the Disabled which supports 52 Quadraplegic patients came under attack whilst patients were still inside. This is a very serious war crime. You can also read more via Channels 4 exclusive coverage from within Gaza click here. 16th July 2014 - El Wafa Elderly Care Home has been attacked by occupation forces. This was deliberate firing on a medical facility by thei occuppiers. For more information click here. 11th July 2014 - El Wafa Hospital has been attacked by occupation forces, there are about a dozen volunteers from the International Solidarity Movement protecting the hospital. Photos just below the news section - plus other photos from the areas around the hospital. LATEST UPDATE FROM LIVE FROM GAZA - from world renowned journalist Mr Akram el-Satarri at Press TV, who is also a very close friend of mine. His brave front line reports have given the whole world a clear insight into what is really happening and the full extent of the isareli war crimes. The aim of this project was to provide vital Medical Aid, Educational Aid and Clothing to the civillians suffering in Gaza and everything was donated via EL-WAFA REHABILITATION HOSPITAL for Disabled, Amputee, Quadraplegic patients and EL-WAFA ELDERLY CARE HOME and also to the EL-WAFA CHARITABLE TRUST which works extensively with the poor, orphans and widows at Khan Yunis Refugee Camp. Since June 2007 there has been a seige on Gaza, both Egypt and Israel control Gaza's borders, water and airspace and restrict the amount and type of goods it allows to enter Gaza .. Israel and Egypt currently do not allow Fresh Meat, Fresh Fruit, School Books, School Stationary, Corriander, Jam, Baby Milk, Building Materials and even CHOCOLATE (and many more items) to enter Gaza .. many people are suffering because of these actions, politics aside - civillians should not suffer like this, especially not the disabled and elderly who are already disadvantaged, what hope is there for the children of Gaza? Today over 100,000 suffer from trauma-related ill health psychological disorders. The brutal occupation has caused grave hardship to many Palestinian children. PHOTOS - Delivering Vehicle and Aid to EL-WAFA REHAB. HOSPITAL and ELDERLY CARE HOME and to widows and orphans. NEWSFLASH - I am now working even more closely with EL-WAFA REHAB. HOSPITAL and EL-WAFA ELDERLY CARE HOME. The hospital has 52 in-patients, all of whom are bed bound, they include Men and Women, Boys and Girls, none can get out of bed without help. This hospital was attacked by occupation forces as it is just over 1,200 metres away from the border, feel free to see my photos of the destruction, the patients and the brave dedicated staff who risk their lives to help the disabled and elderly people of Gaza (Palestine). The blockade of the Gaza Strip is putting residents' health at risk, the UN and aid groups have warned. Medical facilities and equipment are in disrepair, many damaged in Israel's military operation a year ago have not been rebuilt, they said. Some 27 patients died last year waiting to be referred out of Gaza, they said. UN agencies and the Association for International Development Agencies (AIDA), which represents more than 80 humanitarian organisations, said the Israeli restrictions were "undermining the functioning of the health care system and putting at risk the health of 1.4 million people in Gaza". Max Gaylard, the UN's humanitarian coordinator in Gaza, said the blockade was hampering the provision of medical supplies and the training of health staff. He said it was also "preventing patients with serious medical conditions getting timely specialised treatment outside Gaza". Some treatments, such as complex heart surgery and treatment for certain types of cancer, are unavailable in Gaza. The agencies highlighted the case of 19-year-old Fidaa Talal Hijjy, who they say died while awaiting permission to leave Gaza for a bone marrow transplant she needed to treat Hodgkin's disease. They said she had applied for permission three times to attend appointments at hospitals in Israel, but each time the Israeli authorities failed to respond in time and she missed the appointment. Her request was approved the day after she died, on 11 November. The World Health Organization says 88 people have died while waiting for permits since November 2007. 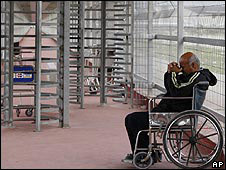 On average 20% of essential drugs were out of stock in Gaza between March and November 2009, according to WHO figures. Israel allows most medicines into Gaza, but there have been problems with the supply chain. Most Gazans are not allowed to leave the territory, and the agencies also said medical staff had generally been unable to travel out of Gaza to update their expertise. Fifteen hospitals and 43 clinics were damaged or destroyed in Israel's operation in Gaza a year ago and most had not been rebuilt because constructions materials have not been allowed in, the agencies said. The Israeli authorities are yet to respond to the aid agencies' statement. However, in the past Israel has said extensive security screening is necessary for patients who wish to leave, as three people with permits to leave for medical reasons have been found to be planning attacks in Israel. It has also said it has offered to facilitate passage through Israel to Jordan for Gazan patients it refuses permits to on security grounds. Israel said the 22-day military operation, which began on 27 December 2008, was aimed at halting rocket fire by Palestinian militants into Israel. It says the almost total ban on construction materials such as cement entering Gaza is because they may be used for building rockets, launch pads or weapons smuggling tunnels. Israel tightened its blockade of the Gaza Strip in June 2007, after Hamas forced out the forces of its more secular rival Fatah, which the Islamic movement had beaten in elections the previous year.